Back in the '70s, was anybody happier than the Partridge Family? I mean, really. They all ride around in a bus together in familial bliss, singing, looking slick. PLUS they all got to be near David Cassidy, who surely smelled of baby powder and repressed sin. Paul Westerberg takes on this gem of American pop history when he covered their "I Think I Love You" song live on several occasions in recent years. I have to say that I appreciate how he makes it a bit manic and obsessive. A little creepy? Off-key warbling never sounded so refreshing. For the record, I am (was? am.) a big fan of the Partridge Family and can sing many of their songs forward and back. Just ask sometime. It's a showstopper. Just when I think I've heard every off-the-wall Replacments/Westerberg cover, you go and lay this one on me. And you're right -- he does add a sorta dark creepiness to this karoake favorite. I love all of the random crowd noise at the end,too. You're right about the manic quality. There's some of that in almost everything he does, but it really shows in the covers. 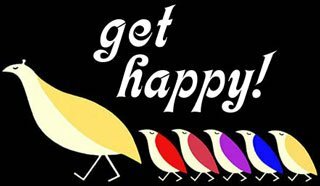 The Partridge Family's Get Happy is on an EP by Westerberg's ex-bandmate Tommy Stinson, with his band Perfect. Not too shabby either. Play "Get Happy" next to Westerberg's "As Far As I Know" - same deal.